Ulster head coach Dan McFarland expressed his disappointment as his side were beaten 44-12 by Racing 92 in Paris on Saturday evening. Tries from Teddy Iribaren, Wenceslas Lauret, Juan Imhoff, Teddy Thomas and Simon Zebo plus 18 points from the boot of Finn Russell secured victory for the hosts. Ulster scored two tries of their own courtesy of David Shanahan and Jacob Stockdale, with Billy Burns converting one. “It’s a funny one, I’m really disappointed, but we showed a glimmer of what we’re capable of. But we got a lesson in accuracy,” said McFarland. “Throughout the game we demonstrated we could cause them trouble, but ultimately there were a few things we needed to get right for us to be be competitive in this game. “One is whenever we created opportunities we needed to be accurate and we didn’t do that. 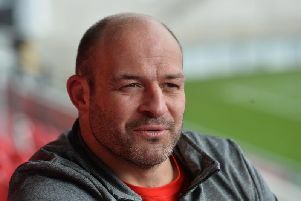 “Our lineout also wasn’t great and we have to be better in that aspect of the game. “We’ve been getting turnovers at the breakdown all season, but we couldn’t get many against Racing. “We were also given a lesson in terms of accuracy and finishing off our opportunities. Ulster started the game strongly with a scintillating try from Shanahan which was started by full-back Michael Lowry in his own 22. Stockdale crossed at the far left-hand corner soon after to further extend their lead. But that was as good as it got for McFarland’s side, with Racing hitting back with two first-half tries through Iribaren and Lauret. The Parisians were wholly dominant in the second half and crossed for a further three tries to secure the bonus point with Imhoff, Thomas and Zebo all touching down. In spite of slipping to their first European defeat this season, McFarland remains optimistic about Ulster’s prospects. He said: “We have been a little bit up and down, but when we get it right we are very good. “I’m a glass half full sort of person, so I’ll be emphasising the positives from this game to the players and we’ll look to improve what we didn’t do right. “We had some young players out there and some relatively new combinations. “We are a work in progress and we will keep working on the style we want to play.